Cardona is a town ìn Catalonia, Spain, in the province of Barcelona; about 90 km northwest of the city of Barcelona, on a hill almost surrounded by the river Cardoner, a branch of the Llobregat. Cardona is a picturesque town, with a citadel named the Castle of Cardona set high on a hill, and the 14th-century Romanesque Church of St. Vincenç. It is celebrated for the extensive deposit of rock salt in its vicinity. The salt forms a mountain mass (called Muntanya de Sal) covered by a thick bed of a reddish-brown clay, and apparently resting on a yellowish-grey sandstone. It is generally more or less translucent, and large masses of it are quite transparent. The hill has been worked like a mine since Roman times; pieces cut from it have been carved by artists in Cardona into images, crucifixes and many articles of an ornamental kind. Mediaeval Castle with Tower and Romanesque Church. The Hotel is located on a headland in a 9th century fortified enclosure, alongside the 11th century Minyona tower and an 11th century church with characteristic features from the surrounding Catalan Romanesque. Its location provides exceptional panoramic views over the city and the fertile lands bathed by the River Cardoner. Some of the hotel rooms have charming canopy beds. Pits, towers, walls and gothic features come together with a predominantly comfortable décor and Catalan-inspired mediaeval furnishings. Catalan cuisine is served in the dining room including aubergine terrine with pig’s trotters, selections of sausages and especially barbecue dishes with the braised lamb shoulder a highlight. Vic is the capital of the comarca of Osona, in the province of Barcelona, Catalonia, Spain. Vic's location, only 69 km far from Barcelona and 60 km from Girona, has made it one of the most important towns in central Catalonia. A Masía with Views - The hotel is in one of the most beautiful natural settings in the Osona area, with the Guillerías mountains in the background and the Sau reservoir at its feet. The peaceful scenery is ideal for outdoor and adventure sports and for visiting very old Romanesque churches. This is the closest Parador to Barcelona (82 km. by motorway). With the Parador just a step away, one can visit this cosmopolitan city and return every day. The Parador reflects the traditional style of the Catalan masía or country house, with its well-tended garden, rooms with terrace and a magnificent swimming pool with exceptional views, and spacious, comfortable lounges. The best of Catalan cooking - In the restaurant you can sample the traditional gastronomy of the Osona region. Tortosa is the capital of the comarca of Baix Ebre, in the province of Tarragona, in Catalonia, Spain, located at 12 metres above the sea, by the Ebre river. Population 34,832 (2007). After more than four hundred years of Muslim Arabic rule, the city was conquered by the Count Ramon Berenguer IV of Barcelona in 1148. Begur is a city in the province of Girona (Gerona), Spain. It is located in the Catalan comarca of Baix Empordà. Begur has 3,986 inhabitants (according to the census of 2005). 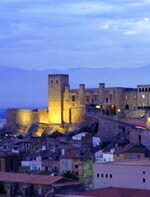 It is an important tourist attraction in the Baix Empordà. During the summer, the population can exceed 40,000 people. Despite of its touristic character, the village has an important historical remnants that go back in early history. 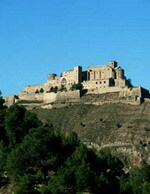 The castle of Begur is a good example of medieval remains. The castle was constructed in the 16th and 17th century. The town of Begur also includes Esclanyà (with a Roman town centre), Aiguafreda, Sa Riera, Sa Tuna, Aiguablava and Fornells. Some of the most prestigious beaches of the Costa Brava can be found here: Sa Riera, Aiguafreda, sa Tuna, Platja Fonda, Fornells and Aiguablava. 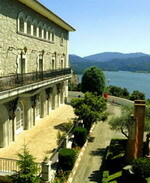 The latter is also home to a Parador Hotel. 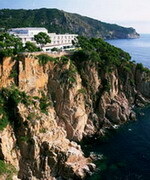 The Parador de Aiguablava is situated in the unique Punta D'es Muts enclave, surrounded by pine trees and overlooking the sea. Here guests can enjoy beautiful beaches, coves and unspoilt landscapes. 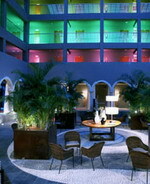 It is an ideal location for sports and outdoor activities, as well as relaxing walks through picturesque green settings. Under the distinctive light of the Mediterranean, the hotel provides its guests with a high level of comfort and a range of services both for individual guests and business conferences. There is a gym, swimming pool and sauna, as well as rooms with spectacular views overlooking the sea. Coastal influence is also reflected in the ‘ampurdanesa’ cuisine, whose typical dishes include sea urchins, baked snails and chicken and lobster stew. During the summer, dishes can be sampled on the beach alongside the restaurant. The Parador has its own restaurant, ‘Mar i Vent’ which is separate from the hotel located in the neighbouring cove overlooking the Mediterranean Sea. La Seu d'Urgell (formerly Urgell) is a town located in the Catalan Pyrenees, is the capital of the comarca Alt Urgell, head of the judicial district of la Seu d'Urgell and the seat of Bishop of Urgell, one of the Andorra co-princes. It is in the functional area of Alt Pirineu i Aran (High Pyrenees and Aran), is the town with more inhabitants, concentrating the 17'4%. With Puigcerdà concentrate the thirty percent of the population of the area. It is located in the confluence between the river Segre and Valira. The city is in the local region of Urgellet, a Pyrenean region formed by 16 municipalities of Alt Urgell. Urgellet and Andorra were the originary County of Urgell with capital in la Seu d'Urgell before the county expansion to the south. Alt Urgell is the gateway to the state of Andorra and the proximity to this important population center and economic activity is largely one of the reasons for the current drive of the city of la Seu d'Urgell within Alt Pirineu i Aran. The town's patron saints are Sant Ot d'Urgell, Sant Sebastià and the Virgin of Urgell. While the Virgin of Núria and Sant Ermengol are the main patrons of the diocese of Urgell. Sant Ermengol is the most prominent in the city than other patrons. Probably that's why there are various events throughout the year dedicated to Sant Ermengol, as the Sant Ermengol Fair, one of the oldest in Catalonia, and the altarpiece of Sant Ermengol. Alongside the Romanesque cathedral of La Seu d'Urgell towers the Hotel, in a monumental and natural setting which attracts numerous hikers, mountain lovers and an infinity of tourists who take a step closer to Andorran heaven. The world-famous Parc Olímpic del Segre Canoeing Championships are held here in the summer. Of note in the interior are the ancient Renaissance cloister and a pleasant covered swimming pool. Seventy-nine rooms, a covered pool, sauna, solarium, coffee shop, air conditioning in all rooms... make this Parador a tempting offer of accommodation from which to explore the most beautiful and attractive areas of the Catalan Pyrenees. 'Alt Urgell', the Parador´s restaurant, can be accessed directly from the street or from the Parador itself. Here, both registered and non-registered guests can savor the delights and flavors of the Lérida region. Vielha e Mijaran is a municipality in the comarca of the Val d'Aran in Catalonia, Spain. It was created in 1970 by the merger of the municipalities of Arròs e Vila, Betlan, Escunhau, Gausac, Vielha and Vilac: the former municipalities retain some privileges as "decentralised municipal entities" (entitats municipals descentralitzades, EMD), as does the village of Betren. Mijaran literally means "Middle Valley" in Aranese, as the habited part of the municipality is situated in the valley of the Garonne (Garona). The Noguera Ribagorçana has its source on the territory of the municipality, on the opposite side of the watershed. The ajuntament (town hall) is in Vielha, which is also the capital of the comarca. The municipality is linked to France and to the rest of Catalonia (via the Vielha tunnel) by the N-230 road. The C-28 (old name: C-142) road continues up the valley to Naut Aran, and on over the Bonaigua pass (2072 m) to the comarca of Pallars Sobirà. This road, the higher stretches of which are impassable in winter, was the only route between the Val d'Aran and the rest of Spain before the opening of the Vielha tunnel in 1948. The hotel is in an area of unparalleled beauty, the Arán valley, of green and white landscapes beneath the radiant light of the Pyrenees of Lleida. Ideal for skiers, ramblers and nature-lovers, the hotel’s rooms offer unbeatable views of the mountains, even more spectacular from the circular glazed restaurant. Many of the hotel’s bedrooms have views of the valley and terrace. Come to the Parador de Vielha for an unforgettable experience. 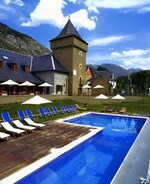 Let the beauties of the Arán valley bewitch you, and relax in the Spa of the Parador. 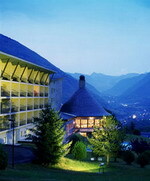 Try the services of the Vielha Spa. We recommend satisfying your hearty mountain appetite with traditional Pyrenean dishes such as civet of wild boar, pescajus pancakes with cream or the delicious local stew, olla aranesa.